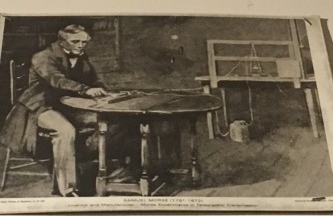 QUESTION: Samuel Morse took an interest in numerous methods to capture information, from painting to the telegraph to photography. What famous New Yorker learned his trade from Morse? Today's blog is dedicated to a man represented in our lithograph collection whose impact on modern communication continues to be felt today. Samuel F.B. Morse is a fascinating character. Born into privilege in 1791, Morse attended the prestigious Phillips Academy and Yale College, where he was introduced to early experiments in electricity. Meanwhile, he made money by painting. His portraits, landscapes, and historical stories were regarded well enough to gain him a position in London's Royal Academy. Morse was amazingly ambitious, and losing the commission to paint interiors of the U.S. Capitol Building proved a blow to his ego. Meanwhile, he was painting the beloved General Lafayette when he received word that his wife was dying. Before he could run to her side, she passed away. Devastated, Morse became obsessed with finding a way to improve the speed of communication. Morse surrounded himself with innovative men with whom he figured out an effective telegraph system. In 1838, Morse and compatriot Alfred Vail created a method to send messages anywhere their wires were installed with immediate results. Morse devoted much of the rest of his life developing the telegraph in the United States and the rest of the world, as well as protecting his patents. Right around the same time he and Vail developed the telegraph, Morse met a man named Louis Jacques Mande Daguerre. Daguerre developed a method to preserve an image on a silvered copper plate. Morse was fascinated by it and became one of the very first American advocates of this incredibly important method of preserving images for posterity. Today, Morse is remembered best for his patents in telegraphy. Of course, today's technological revolution makes the telegraph archaic and, indeed, it is not used anymore. But in its day, its impact was greater than we can possibly imagine. ANSWER: C) Matthew Brady, who made himself famous for his portraits and battleground images during the Civil War.